Marcel Schwob’s Imaginary Lives, first published in book form in 1896, is a compilation of semi-biographical fragments, miniature portraits of famous and infamous historical figures. Schwob claims that these individuals possessed nothing more than their peculiarities—their ideas belong to the shared heritage of humanity—and so magnifies the characteristics that made them unique. He shows us the crescent-shaped birthmark under Herostratus’s left breast, describes the collection of bird illustrations that covered the walls of Paolo Uccello’s home, and tells us that Mr. Burke was an insatiable listener but preferred to imagine rather than hear the end of a story. Each biography consists of the birth, life, and death of an individual. Schwob does not give events the shape of a story or correlate personal details to general ideas. Rather, each stage of life is described as though it were a still image, which makes up part of a collage. What look like historical accounts are actually imagined, blurring the distinction between plagiarism and translation, fact and fiction, reality and representation. This is a theoretically informed critique of biography as a genre—to understand it you must pause at the threshold. Her portrait is encircled by the following inscription: Matoaka alias Rebecca filia potentissimi principis Powhatani imperatoris Virgini. In it, poor Matoaka wore a tall felt hat with two garlands of pearls; a large ruff collar of stiff lace; and she held a feather fan. She was thin of face, her cheeks gaunt, her eyes large and gentle. Schwob draws out the meaning in her facial features, making her alive, individual, able to gaze back at the reader. The dead are brought back to life but kept framed behind glass. The author does not aim to summarize a life through a chronological series of events but to gesture toward the imaginary. The real contends with the possible through a few brushstrokes that render scenes from someone’s life believable. Like all great fiction, disbelief is suspended in the communication between reader and writer. This brings the latter to the forefront, as storyteller. Schwob is interested in the enlargement of a detail, which, like in a dream, has symbolic rather than causal meaning and thus gestures towards an individual’s inner reality—their way of imagining a place in time. Imaginary Lives is framed by the author’s preface and the translator’s afterword. The two resemble each other in that they describe the process of rendering legible their interpretation of a text. Schwob amalgamates rewritten textual artifacts, plagiarized fragments that imitate yet remain distinct from the prose and narrative of his sources. Meanwhile Chris Clarke, the book’s translator, renders that same compilation legible in another language. Clarke is Schwob’s accomplice; he preserves the abrupt shifts in style that signal the presence of a textual antecedent. The deceitful game they play hinges on whether the reader recognizes the plagiarized text. Clarke argues that Schwob approaches writing like a translator. A biographer exposes their subjects’ uniqueness best when they cease trying, and this is also the beauty of translation—when the pressure of originality is set aside, when work on the microscopic level of word choice and macroscopic level of narrative structure are woven together, following a pattern yet attentive to each carefully stitched thread. Both on the level of word choice and of narrative structure, Schwob is influenced by the writers he has translated: Defoe, Shakespeare, Crawford, Wilde, de Quincey, and Stevenson. Indeed, his preface, which explains how the sources were selected, intertwined, and reworded, redefines the biographer as an artist rather than a historian. The city of Ephesus, the birthplace of Herostratus, sprawled from the mouth of the Cayster with its two river ports all the way to the quays of Panorama, from where one could see the foggy outline of Samos on the many-hued sea. It had been overflowing with gold and fine cloth, wool, and roses, ever since the Magnetes, with their dogs of war and their spear-hurling slaves, had been defeated on the banks of the Maeander, ever since the magnificent Miletus had been left in ruins by the Persians. The concision and precision with which Schwob recounts the geography, economy, and history of a place renders it both foreign and vivid for the reader. Meanwhile he draws out our sensory experience of objects—the muted sound of little lizards falling from the roof, or the tails of raccoon skins sewn, tail down, on the robe that covers a throne. A sense of discovery is attributed to the most ordinary object, which is made exotic, baroquely adorned. Between Mount Prion and a tall, steep cliff, on the bank of the Cayster, stood the great Temple of Artemis. [ . . . ] The chamber of the goddess was small and oval in shape. In the center stood a stone of the most remarkable blackness, conical and gleaming, marked with lunar gildings: this was none other than Artemis herself. [ . . . ] She possessed treasures which were enclosed in a hive-like object painted in green, the pyramidal door of which was barbed with nails of bronze. There, among the rings, the abundance of coins and rubies, rested the manuscript of Heraclitus, who had proclaimed the reign of fire. Schwob moves from the temple’s edifice to its centerpiece, the treasure trove, and finally to the hidden manuscript. Respect for the place where the secret object resides allows it to retain its mystery and makes the city inhabitable. But Herostratus infiltrates, loots, and finally sets fire to the sacred site—once it is trespassed and the object extracted, the whole city is no longer livable. Each portrait fragments the subject’s body into parts, because prose, unlike painting, must be sequentially read. Schwob is aware of this and alludes to it in his biography of Paolo Uccello, who is depicted drawing his lover, Selvaggia: “Uccello depicted the stiffening of her corpse, and the joining of her lean little hands, and the lines of her poor closed eyes. He did not know she was dead, the same way he had not known she was alive.” When alive, Selvaggia confuses Uccello’s attention to her appearance with genuine affection; he is so concerned with the shape, size, and comportment of her body that he continues to draw her even after she has passed away. The danger of dismembering a body in order to appreciate the details that make it unique is that the humanity of the individual is forgotten. Like the faceless man in Edgar Allen Poe’s “The Importance of the Perverse,” each character stands—as a child, adolescent, or adult—at the edge of a precipice contemplating a plunge. The perversion, here, is the obsessive contemplation of an object that, by the time it is rendered beautiful in the eyes of the beholder, has transformed them. Just then, Adderly saw a lovely white alga on the side of the reef, and he wanted it. An Indian dove into the water and tore it out. It hung straight down as he brought it up. It was very heavy, and its tangled roots appeared to be clutching a small stone. Adderly hefted it and struck the roots against the deck to rid it of its weight. Something glittered as it rolled under the sun. Phips let go a cry. It was an ingot of silver worth at least three hundred pounds. These lines evidence the dangerous allure of the inanimate: Phips is described as dying destitute, holding the ingot of silver. The interaction with an object leads the subject to his death in Suffrah’s biography, too. As he slips the ring off King Solomon’s dead finger an earlier prediction is fulfilled: he is not granted immortality but meets his own mortal end. If ideas disappoint me, give me no pleasure, it is because I offer them my approval too easily, seeing how they solicit it, are only made for that. [ . . . ] On the other hand, objects, landscapes, events, individuals of the external world give me much pleasure. They win my trust. For the simple reason that they don’t need it. The realm of things demands less from the onlooker than the world of ideas does from the thinker. Schwob captures this reality by preserving the mystery of each inanimate object and the actor that mobilizes it. Personal details are not causal links between events in the construction of a narrative, nor are objects allotted metaphorical meaning. The white alga clinging to a stone does not symbolize the wealth of the sea, nor does William Phip’s life story serve as a warning against greed. Schwob manages to narrativize without moralizing by refusing to speak on behalf of anyone or anything. The lack of causality between events in Imaginary Lives recalls the ethos of the decadent poets. Poe defines the perverse as, “a mobile without motive.” In Schwob’s hands, perversion is not an inescapable fate for each character, nor does every object corrupt its owner, nor every landscape make travelers lose their way. But when this does occur, the life of that individual does not halt upon the encounter with an obstacle but continues toward their ultimate demise, one fitting to the life led. 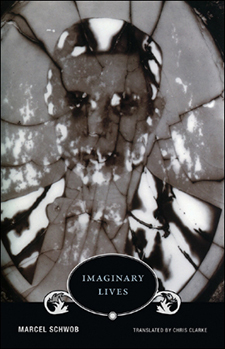 In his preface to A Universal History of Infamy—a set of fictionalized accounts of real criminals first published in 1935—Jorge Luis Borges acknowledges the influence of Imaginary Lives while pointing out the danger of perversion, and the vacuity of a book, like his own, which is composed of an assemblage of sources. Borges and Schwob are both descendants of the ficto-biography genre; Plutarch, from whom they borrowed, predates them both. In his afterword, Chris Clarke argues that Schwob’s work is crucial in restabilishing the lineage linking Plutarch to Borges. Borges’s descriptions are informed both by Schwob’s ekphrastic portraits and by the counter-cultural implications of the Latin American Baroque. The Baroque was exported with colonizing intent but became a countercultural instrument in Latin America. The work of literary figures like Sor Juana Inés de la Cruz conveys a pre-Colombian cosmology in a European literary style, in which the transition from a pre-Hispanic civilization to a European empire-building project is evidenced in the friction between content and form in her writing. Ekphrasis and the Baroque both refuse to inform content: one describes and the other decorates. They render vacuity and imitation valid. Rather than tracing a lineage from Plutarch via Schwob to Borges, we should do so in the other direction: from Borges via Schwob to Plutarch. Doing so reveals the political potential of ficto-biography, because Borges’s exercises in narrative prose demonstrate that there are alternative ways of recording history, specifically the history of the colonization of the Americas. The uniqueness of a biographer’s prose and narrative structure are exposed by the imitation of form and the plagiarizing of content. Imitation is a performance of resemblance that exposes the inimitable identity of the performer. Elisa Taber is a writer and anthropologist. She explores the interstice between translation and epistemology in the Nivaklé narratives of the Paraguayan Gran Chaco. Both her stories and translations are troubled into being, even when that trouble is a kind of joy. Elisa graduated from The New School for Social Research with a master of arts in anthropology. She currently serves as editorial assistant for the Curatorial Design Research Lab at Parsons, The New School for Design.